Many functions of the 3D menu bar can be accessed directly using keyboard shortcuts. 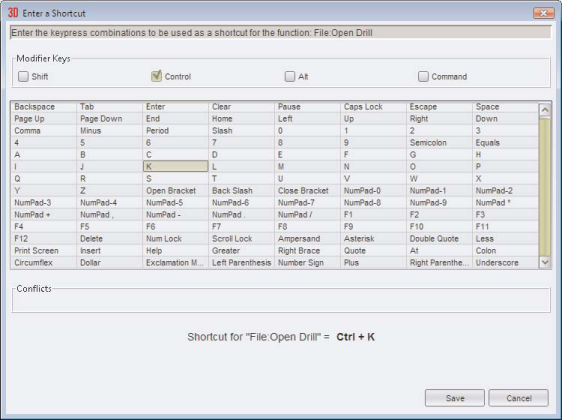 You can create more than one set of shortcuts. This is useful if more than one person is using your installation of 3D. Each individual can setup the shortcuts according to their preferences. To create your own shortcut set, select a set that most closely matches the set you want to create for yourself. Typically, one choose Default as the set to copy. Select the set by choosing a set name from the Shortcut set menu appearing at the top of the Shortcut Editor. Click New Set to make a copy of the currently selected set with a new name. Likewise Delete removes the currently selected set. To edit a shortcut, click on the shortcut description appearing in the list of shortcuts and click the Edit button. Shortcuts from the Default set can not be edited. Click the key commands you want to use as the new shortcut. To remove a shortcut, click on the shortcut description appearing in the list, and click on the Clear button. The shortcut will be removed. To reset a shortcut to its default value, click on the shortcut description appearing in the list, and click Default. To save the changes click Save. The currently selected Shortcut Set will be the set used in the application when the Shortcut Editor is exited after saving.